Turkey's role in the on-going war of Syria has been a subject of controversy from the beginning. From initially supporting the US and NATO to clashing with Russia, the ‘sick man of Europe' has recently been seen making a dramatic turn towards Russia and Iran, resultantly withdrawing from its demand of Assad's exit from power. Ever since the policy turn, Turkey has been cooperating with Russia and Iran in Sochi and Astana peace processes to bring the war to an end. And just when these plans were starting to pay off, Turkey took yet another turn when it ‘welcomed' the US missile strike on Syrian as a result of the alleged-and now largely debunked-chemical attack by the Syrian government. This has been followed by Ankara rebuffing Moscow's demand for handing over Afrin, where Turkey has established its control, to the Syrian government, arrogating instead to itself the authority and timing to do the hand-over not to the Syrian government, but the ‘people of Afrin' as Erdogan recently said. This turn has taken place despite the fact that Moscow has recently established a nuclear power-plant in Turkey; Russia has been accommodating ever since Turkey-Russia rapprochement Ankara's interests in Syria by allowing it to do its military operations against the US-backed Kurdish groups and that Turkey is deeply interested in buying Russian S-400 anti-air platforms. What explains the Turkish turn and what Turkey is trying to achieve in Syria needs to be discerned to decipher the complex geo-politics of the war in Syria. Importantly enough, this Turkish-turn happened at a time when the US president has just announced his intentions to withdraw from Syria. While the controversial missile strike turned out to be more of a face-saving-exit strategy for the US from Syria, the announcement in itself meant, as far as Turkey is concerned, that the US might finally be succumbing to Ankara's age-old demand of de-militarizing the Kurds. Much to Turkey's pleasure, the US president has already decided to end their funding and support of Kurdish militias in Syria. According to media reports in the US, the White House has ordered to put on hold US$200 million, which was meant for "infrastructural funds" in the Kurdish controlled areas of Syria. This freezing of aid plus the fact that the US is seriously considering to withdraw its troops mean that Turkey will be left with practically no hurdles to suppress the Kurdish militias away from its border. This potentially means that the US is now willing to address Turkey's long-standing demand to wean it back from its increasing confluence with Russia and Iran. The US, in other words, after having lost the means to influence the ground situation in Syria, is now wooing Turkey back and influence the Syrian end-game through it. The in-coming US Secretary of State, Mike Pompeo, has already hinted at such a possibility. In his confirmation hearing, he responded to the question of trilateral dialogue between Russia, Iran and Turkey, saying that "the American people need to be represented at that table" and that "[w]e can be part of that conversation." And while Turkey's major concern has been Kurdish concentration on its border, causing instability to reach Ankara, NATO, too, now seems serious to redress this factor. This was confirmed by NATO Secretary General Jens Stoltenberg during his recent visit to Turkey where he said that no NATO member has suffered more terrorist attacks (read: PKK attacks) than Turkey, saying that it is "the ally most exposed to the instability in this region." Turkey, therefore, has no hesitation in responding positively to the West over its willingness to take its core interests into account. Turkey, which is still a committed NATO member, would therefore certainly want to remain so and spearhead Western interest in Astana and Sochi, and play the game in a way that would limit both Iranian and Russian influence in Syria and the Middle East. But how exactly is this happening? Turkey's differences with Russia and Iran on the question of Afrin have already become well-known. With Turkey refusing to hand-over Afrin to Syria and linking its withdrawal from Afrin to the withdrawal of other foreign forces (read: Russian and Iranian) from Syria, it has sent a clear message to both Moscow and Tehran: that its alliance with them remains temporary alliance of convenience and that it tends to separately with deal its economic relations with Russia and its interests in Syria, which converged to the extent that Russia allowed Turkey to do its operations against Kurds, but are now diverging on the question of restoring the territory to the Syrian government. These disagreements underline strongly that despite cooperation, Turkey is far from abandoning NATO for either Russia or Iran. But by re-projecting itself as a key-actor and a decider, Turkey has indicated that it remains suspicious of both Astana and Sochi processes and that it wants to chart its course through Afrin and Idlib, the latter being already the subject of fierce negotiations and undoubtedly the next war objective in Syria. 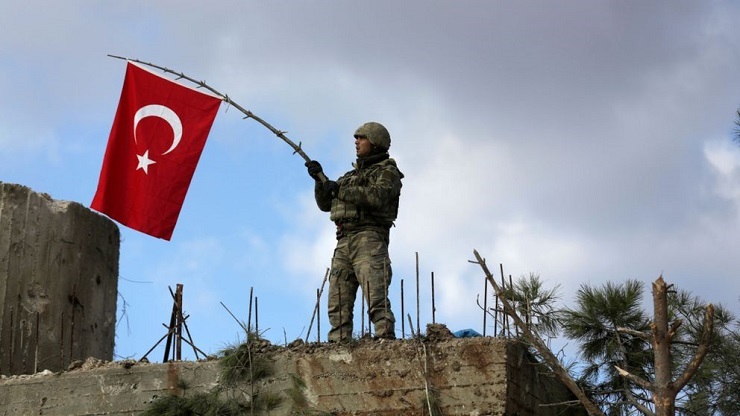 For Turkey, Idlib remains a key, and it has previously urged Russia and Iran to prevent a Syrian offensive from taking place there. With that offensive now likely to begin any time, the importance of Afrin has increased all the more for Turkey as it intends to use it as a means to keep poking in Idlib and keep Turkey-backed Jihadi elements entrenched to influence the final outcome of the Syrian end-game and extract maximum concessions from Russia and Iran in the up-coming Sochi conference. Salman Rafi Sheikh, research-analyst of International Relations and Pakistan's foreign and domestic affairs, exclusively for the online magazine "New Eastern Outlook".